Learn more about Buffalo, New York using the City Guide below. Plan a trip, find local shopping centers, or just discover what makes Buffalo, New York so great! Buffalo is a city in the state of New York in the United States of America. Buffalo is New York state's second-largest city with a metropolitan area population of nearly 1,200,000. Buffalo, once a bustling industrial city, is now better known for its colleges and cultural scene. The city is increasingly becoming known as one of America's most hospitable cities after being awarded the titles of third cleanest city, USA Today's "City with a Heart", and winning the "All-America City Award" twice. Buffalo, although most famous for its winters, has four very pronounced seasons. In winter, the city can get "lake effect" snow: the winds running the length of Lake Erie pick up a lot of water vapor, which is dumped as snow as soon as they reach land. Contrary to popular myth, however, Buffalo is not the coldest or snowiest city in the country- or even in New York. The Buffalo airport averages 93 inches of snow per winter. On average Buffalo only has 3 days per year where the recorded temperature dips below 0 F. Buffalo's snowy reputation is based in large part on some of its most famous storms: The Blizzard of '77, and the Surprise Storm of '06, both which received a lot of media coverage; however, neither is a normal occurrence in the average Buffalo winter. Spring in Buffalo are rainy and cool up through the end of April. The temperatures can fluctuate wildly in March and April. It is not unusual to see snow one day, and a temperature in the mid-60's the next. Summers tend to be very comfortable and sunny. The moderating effects of Lake Erie have allowed Buffalo to be one of very few places in the US to have never had the temperature reach 100 F. Most summer days are in the 70-80's with evenings in the comfortable mid 60's. On average Buffalo has 60 days a year with temperatures reaching over 80 degrees. Buffalo has more sunny summer days than any other major city in the northeast. Fall in Buffalo is warm and beautiful as well. The temperature usually stays warm enough through mid November, and one can watch the trees change colors in comfort. The days are warm, and the nights are cool, and Buffalo's first frost doesn't usually come until after well after Halloween. Leaf hunters will be pleased with the amount of trees (Buffalo is also one of the most tree-filled cities in the nation!) as well as in the surrounding areas. Buffalo Niagara International Airport (IATA: BUF) (ICAO: KBUF), +1 716 630-6000. The area's primary airport. While it is an international airport, it earns the designation mostly from a few flights to Toronto and has few other flight to distant urban centers. The Thruway (I-90) runs east to west and connects Buffalo to other major cities - New York, Rochester, Syracuse and Albany to the east and Cleveland, Ohio and Erie, Pennsylvania to the west. I-190 runs north and south, mostly along the Niagara River and connects Niagara Falls and Buffalo. I-290 connects various suburban areas to the north and northeast of the city.I-990 connects Lockport to the rest of the thruway system and the city. By car, Buffalo is about two hours from Toronto, one and a half hours from Rochester, two and a half hours from Syracuse, and 7 hours from New York City. Buffalo is accessible from the east by Amtrak trains. Though there is a downtown station, most visitors to Buffalo will get off at the Depew, NY stop (BUF), and take a cab ride the remaining 20 minutes into the city. The (BFX) stop in downtown Buffalo is generally bypassed and not well serviced. Buffalo is also serviced directly by Greyhound buses. The city has a large bus depot in the heart of downtown. Greyhound Buses, 181 Ellicott St., (716) 855-7533. Buffalo has a one line subway system that runs from the University at Buffalo Main St. Campus on the North side of the city to the Marina and Harbor in downtown Buffalo. When the subway reaches the Theater district it comes above ground and is free. To go North, it costs $3.00 for a round-trip ticket, or $1.50 for a one way ticket. Buffalo has several expressways leading in and out of the city, but like many other cities, they lack capacity during rush hour. There is limited taxi service n urban areas. Do not expect to be able to hail a cab except outside the airport. However, good dispatch is available. There is a fairly extensive bus service operated by the Niagara Frontier Transportation Authority (NFTA), which serves the city and outlying suburbs. There is one subway line that runs from the University at Buffalo South campus into Downtown Buffalo, and is used quite a bit by employees who commute into Downtown each day. Albright-Knox Art Gallery, 1285 Elmwood Avenue, +1 716 882-8700 (Fax +1 716 882-1958). W-Su 10AM-5PM (F until 10PM). An amazing gallery that's free on Friday nights (otherwise Adults $10, seniors/students $8). Theodore Roosevelt Inaugural National Historic Site, 641 Delaware Avenue, Phone: +1 716 884-0095 (Fax +1 716 884-0330). Year-round M-F 9AM-5PM, Sa Su noon-5PM. Lectures, exhibits, tours, gardens. Adm. Adults $5, age 62+ and students $3, ages 6-14 $1. Buffalo Museum of Science, 1020 Humboldt Parkway, +1 716 896-5200, +1 866-291-6660. M-Sa 10AM-5PM. Adults $7, ages 3-18 $5. Buffalo and Erie County Naval and Military Park, One Naval Park Cove, +1 716847-1773. Apr-Oct Daily 10AM-5PM. Nov Sa Su and the F after Thanksgiving 10AM-4PM. $8, seniors and ages 6-16 $5. There are two amusement parks (each a bit of a trip from Buffalo). Martin's Fantasy Island, on Grand Island (halfway to the Falls), a small amusement park reminiscent of the originals. There is not a ton of stuff to do there but it is good for a cheap day out with small kids. Larger kids and adults alike will enjoy Darien Lake (now owned by Six Flags), which is a short drive east on the New York State Thruway (I-90, toll road). They have a lot of roller coasters, other smaller-thrill rides, and a pretty good water park. Check into Six Flags season passes as you can usually get one of those for the price of about two admissions to a park (this is usually a pre-season special). Architecture is a wide attraction in Buffalo, with buildings from almost every decade of the city's existence still preserved. Especially prominent is the historic Allentown District, located downtown, various Victorian mansions and other large, old mansions located on Delaware Avenue and the neighborhoods adjacent to its southern edge. There also is the Darwin Martin house, designed by renowned architect Frank Lloyd Wright in the early 20th century. Delaware Park, part of the extended Olmsted Park system, is large, with breathtaking views throughout the spring and fall. The Shakespeare in Delaware Park outdoor festival, takes place here each summer. Buffalo Sabres, HSBC Arena, One Seymour H. Knox III Plaza, +1 716 855-4100 or +1 888-GO-SABRES. Members of the National Hockey League (NHL). Buffalo Bills, Members of the National Football League (NFL). Buffalo Bisons, Seats are usually available and cheap, and provide a great view of downtown. The Buffalo Bisons is part of the farming system for the Cleveland Indians and is a great place to see up and coming talent before it makes the big leagues. Buffalo Bandits, Buffalo major indoor lacrosse team (MLL). Plays games from December through April. Games are affordable and family priced. Buffalo Silverbacks, Buffalo's ABA minor league basketball team which plays at the Buffalo State sports arena. Tifft Nature Preserve, Ohio St. A 264-acre site for environmental education and conservation. Just 3 miles from downtown, operated by the Museum of Science, the Preserve features five miles of hiking trails, and a 75-acre freshwater cattail marsh. Donation. Buffalo Zoo. One of the first zoos in America, the Buffalo Zoo houses many kinds of animals on a small lot. Elephants, bears, otters, sea lions, and hyenas are just some of the creatures on display. Some of the animals, such as a resident peacock, are allowed to roam freely on the walkways, allowing you to get closer to nature than you would in most zoos. Children are $5.00 and adults are $8.50. Buffalo is home to a large number of private and public colleges and universities. The largest school in the area is the University at Buffalo (UB), part of the State University of New York system, which is renowned as a large public research University. UB has two campuses: one to the north in Amherst, and the other on the northern border of the city. Buffalo State College is the region's only public college located in the city, and it is located right on the Elmwood Strip across from the Albright-Knox art gallery. Canisius is also located in the city of Buffalo near the intersection of Humboldt Parkway and Main St. Other colleges in the city include: Trocaire, Erie Community College, Medaille, and D'youville. The University at Buffalo has an annual speakers series which has played host to Bill Clinton, Al Gore and the Dalai Lama in recent years. These events are open to the public; tickets are available from the University's box office. UB has a free series of summer lectures available to the public and Buffalo State regularly has events open to visitors . The Elmwood district is located along the southern portion of Elmwood Avenue. This area contains a variety of small shops with a very 'independent' feel - you won't find national chain stores here. Used books, specialty coffee, one of a kind fashions, organic and local produce, artists' studios, musical instruments - even Sonny's Doggie Bakery for your canine companion - can all be found in this district. Bidwell Park where it meets Elmwood Avenue hosts a farmers' market on Saturday Mornings from Memorial Day to Labor day. The Hertel Avenue district, located along Hertel avenue between Delaware Ave. and Parker Ave. in North Buffalo is home to a wide assortment of shops as well. Art stores, used bookstores, as well as eccentric independent stores like 'Terrapin Station' dot the street that has seen a resurgence as in recent years. Hertel is quickly becoming the new "in" strip in Buffalo. The Allen Street district can in some ways be considered an extension of the Elmwood strip; however, it has a unique life of its own. Amidst the myriad of bars, you'll see bookstores, studios, and even antiques along this well traveled downtown strip. Main Street in the University Heights district is not known for its shopping as much as its bars, but there are worthy places along this strip. The corner of Kenmore Ave. and Main St. has a more suburban strip-mall style appearance along with some more mainstream retailers like AJ Wright and Starbucks. Main street has its share of instrument, specialty, comic, and other second hand stores worth a look as well. Visitors looking for a more mainstream shopping experience should check out the [Walden Galleria] in Cheektowaga (10 minutes from downtown). The Walden Galleria has two levels of shopping in the region's largest mall as well as a movie theater, food court and several other low-priced restaurants. The smaller [Boulevard Mall] on Niagara Falls Boulevard in Amherst is about 20 minutes from the city as well. The Boulevard Mall is located along one of the area's busiest shopping corridors on Niagara Falls where big box retailers like Target, Best Buy, and Home Depot dot the landscape. Frank and Teressa's Anchor Bar, Main st 1046. Birthplace of the original buffalo wings. Still has great wings, salads, etc. Duff's Famous Wings, 3651 Sheridan Drive, Amherst. Anchor Bar invented them, and according to some, Duff's perfected them. Bacchus Wine Bar, 54 W. Chippewa St., 716-854-9463. The wine here is top notch, but so is the eclectic and unique menu. $20-30. Pearl Street Grill & Brewery, 76 pearl Street, 716-856-2337. Free Wireless internet, belt driven fans, three patios, and a great bar and game room on the third floor. They brew their own beer in house, and their pulled pork is the best in the city. This place is very busy on nights the [Buffalo Sabres], the city's professional hockey team is playing at nearby HSBC arena. $10-20. Allen Street Hardware Cafe, 245 Allen St., 716-882-8843. Great small place with good seasonal menu and stellar beer and wine selection. $10-20. Fat Bob's Smokehouse, 41 Virginia Place, 716-887-2971 (FB@FatBobs.Com, fax: 716-332-1201). Open for lunch and dinner 7 days a week. Generous helpings of slow cooked southern comfort food. A carnivore's paradise of St. Louis pork ribs, pulled pork, beef brisket, barbecued chicken, catfish & more. Sinful sides include collard greens, cornbread, creamy mashed potatoes, baked beans, sausage gravy, and mac & cheese. Come hungry. Decent selection of domestic and imported beers. Mains $10-20. Ambrosia, 467 Elmwood, 881-2196. Greek Diner with reasonable prices and a slightly more upscale Mediterranean menu at night. $10-20. Astoria, 423 Elmwood, 716-884-4711. Greek influenced restaurant with great seafood. $20-30. Amy's Place, 3234 Main St., 716-832-6666. 6am-8pm. The best vegetarian/vegan in Buffalo hands down. It has a very eclectic menu featuring some particularly fabulous Lebanese food. Also, if you're an early bird they have the best 99 cent breakfast anywhere in the city. Under $10. Bars and nightclubs in Buffalo can stay open until 4am. Many bars in Buffalo don't get going until sometime after midnight on weekends. There are a lot of strips and bars to choose from in Buffalo. Downtown the most established nightlife scene is along W. Chippewa Street 67 West, 67 West Chippewa, (716) 842-0281. Barrel House, 85 West Chippewa, (716) 856-4645. Big Shotz, 45 West Chippewa, (716) 852-7230. Crocodile Bar, 88 West Chippewa, (716) 853-CROC. McMonkeez Party Bar, 79 1/2 West Chippewa, 716 853-5555. Soho, 64 West Chippewa, (716) 856-SOHO. Third Room, 54 West Chippewa, (716) 842-2787. Laughlin's, 333 Franklin Street, (716) 842-6700. Buckin' Buffalo Saloon, 294 Franklin Street, (716) 853-4400. Popular Country club, and yes it also has a Buffalo you can ride. Many of the budget motels are located just outside the city in one of the suburbs. As there aren't many hotels located in the downtown area, travelers can save money by staying in the suburbs a short 10-20 minute drive away from the city center. Microtel Inns & Suites Tonawanda, 50 Freeman Road, +1 716 633-6200. Residence Inn Buffalo Amherst, 100 Maple Road, +1 716 632-6622 (Fax +1 716 632-5247). Residence Inn Buffalo Cheektowaga, 107 Anderson Road, +1 716 892-5410 (Fax +1 716 892-5409). Best Western Inn - On the Avenue, 510 Delaware Avenue, +1 716 886-8333 (Fax +1 716 884-3070). Hostelling International Buffalo-Niagara, 667 Main St, +1 716 852-5222. Located downtown at the Theater trolley stop, it's one of the cleanest, friendliest, most secure hostels you'll find anywhere. Granger Place Hostel, 5 Granger Place, +1 716 885-2124. Delaware Hostel, 2496 Delaware Ave, +1 716 875-1764. Courtyard Buffalo Amherst, 4100 Sheridan Drive, +1 716 626-2300 (Fax +1 716 626-2322). Holiday Inn, 620 Delaware Avenue, +1 716 886-2121. Richmond Place Inn Buffalo, NY 45 Richmond Avenue +1 716 881-3242 bed and breakfast. Mansion On Delaware Avenue, 414 Delaware Av., +1 716 886-3300. Great place for a romantic getaway. Buffalo's East Side has a somewhat deserved reputation as being a fairly rough place. This is the city's poorest residential district, and the blighted houses and emerging urban prairie does little to dispel the notion that this is a bad part of town. For the most part, this is a working class part of town full of lower to lower-middle class working families. It's good advice not to walk the streets alone at night around Bailey St. or Fillmore Ave. east of Main St.
Buffalo is fortunate to not have much of a vagrant problem. Walking some of the busier city strips such as Elmwood and Allentown you may find the occasional person asking you for change; however, it's nothing like cities like Philadelphia or Toronto where they're out on every corner. Lake Erie Tour Route and Lighthouses. Go back to the mainland and see the shoreline. The drive (or boat ride) around Lake Erie takes you through the working waterfronts around Buffalo, Cleveland, OH, Detroit, MI, Erie, PA, Toledo, OH, and southern Ontario and is intermingled with beautiful preservations of flora and fauna as well as the history of North America's first westward expansion, the Old Northwest Territory. Rochester, NY is a short hour and a half drive away down I-90. Genesee Country Village, 1410 Flint Hill Rd. Mumford, NY, (585) 538-6822,. vary sasonally. See the 19th century come alive in an accurate restored community. Employees don't just tell the history, but they work as townspeople performing various 19th century jobs around the community. $14 adults/ $8 kids. Niagara Falls, NY One of the wonders of the world and a great honeymoon spot, a short 30 minute drive up I-190. Lots of small museums and tourist attractions located just across the border in Niagara Falls (Ontario). Ellicottville, NY The winter season in Buffalo is perfect for skiing. Just an hour south of the city, Ellicottville has 52 slopes, a quaint main street as well as a ton of great bed and breakfasts. Travelling to or from Buffalo, New York? 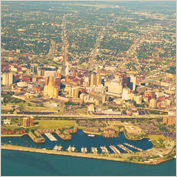 Find flight to or from Buffalo, New York with an Online Travel Agency. Get lodging information or make reservations with a Local Online Hotel. Plan ahead and reserve a car with a Local Car Rental Agency. Are you relocating to Buffalo, New York? Get your transition in order by searching for an Apartment, House, or Job. Goods & Services in Buffalo, New York. Find out the little necessities in life like, Grocery Stores, Department Stores, Gas Stations, Dry Cleaners, Nail Salons, Fast Food, Auto Repair, Plumbers, Shopping Centers and Post Offices. © 2008 YELLOWBOSS.COM. All rights reserved.